WE KNOW HER INTIMATELY, THE LAMB WHOSE FLESH WILL HAVE BEEN SERVED AT MONDAY NIGHT'S "HOOFIN IT" DINNER. WE KNOW THINGS ABOUT HER THAT NO ONE SHOULD EVER KNOW, OR WANT TO KNOW, ABOUT A FELLOW BEING—THE SIGHT OF HER FLAYED BODY, THE WEIGHT OF HER SEVERED THIGH, THE TASTE OF HER BURNED, BONE-PUNCTURED FLESH, THE CHARRED CRUNCH OF HER FRACTURED RIBS, THE FLAVOR OF HER SPILLED MARROW, THE TASTE, TEXTURE AND FLAVOR OF EVERY ASPECT OF HER DESPAIR, DEGRADATION AND DEFEAT. WE KNOW EVERY DETAIL OF WHAT WE HAVE FORCED HER TO BE—AN OBJECT TO CONSUME AND EXCRETE. WHAT WE DON'T KNOW, WHAT WE DON'T WANT TO KNOW, IS WHAT WE MUST KNOW IF WE ARE TO RESTORE OUR OWN HUMANITY: WHO SHE IS. IN THE TRUE SPIRIT OF RESPECT—A WORD WHOSE ROOT MEANS TO 'LOOK BACK AT ONE'—WE INVITE YOU TO LOOK AT BEINGS LIKE HER WITH THE MORAL COURAGE AND INTELLECTUAL INTEGRITY TO ACTUALLY SEE THEM. MEET MARCIE, A BLIND EWE WHO WAS RESCUED FROM A FAMILY FARM SIMILAR TO THE "HUMANE" FARM FEATURED AT TONIGHT'S "RESPECT YOUR DINNER" EVENT. LIKE THE BEREFT MOTHERS WHOSE BABIES WILL HAVE BEEN KILLED AND SERVED AT TONIGHT'S DINNER, MARCIE'S ONLY EXPERIENCE OF MOTHERHOOD WAS ONE OF BEREAVEMENT. UNLIKE THEM, SHE HAD THE FREEDOM, THE RESPECT, AND THE AMPLE TIME TO FIND A MEASURE OF SOLACE. She arrived in this new world with nothing except, for the brief time before she went blind, the ability to see with her own eyes this improbable land of open vistas, big sky, free inhabitants, and people who wished them life, this Free State that billions of captive animals never experience, but that all yearn for to their last breath. And perhaps to believe it. Like all farmed animals, Marcie was defined not by what was there, but by what was missing—the visible and invisible amputations of a lifetime of slavery—mutilated body, broken spirit, wounded soul, stunted life, unfulfilled potential, her measure of pain filled to the brim, her measure of joy left utterly empty. In her years of confinement on a small family farm, where she repeatedly watched her babies being killed, so much had already been taken from her that, by the time she was rescued and brought to a place where she could finally begin her life, there wasn't much left to build a life on. Her first year at the sanctuary, when she could still see, she fled from anyone who looked like her abusers—any human being—and, for the rest of her life, she avoided anyone who looked like herself—every ewe, ram, or lamb at the sanctuary. She "hid" her big, beautiful, billowy self among the goats, dawdling along, so conspicuously ovine amid the gust of quick, slender, angular, light-footed goats, yet so secure in the belief that she was well camouflaged among these creatures who looked, walked, sounded, and acted nothing like herself. She traveled with them, foraged with them, camped with them, ignored the fact that, to everybody's mind but her own, they were a poor fit for her—too fast, too rowdy, too mischievous, too bold, too unpredictable—and forgave them their many trespasses, such as the times when they left her behind, way out in the field, ignored her calls for location, and went home without her. But, for reasons she well understood, she remained unflinchingly loyal to them for the rest of her life. Whatever Marcie saw in the goats, learned from them, received from them, was clearly something she needed. We joked that she thought she was a goat. But, more likely, the opposite was true: what seemed to draw her to the goats was not the imagined similarity, but the perceived difference. She seemed to want to be someone completely unlike herself, a different animal altogether, someone totally unlike the powerless victim she had been all her life. So she joined the goats, and shared her deepest moments of peace with them. You could see her, and them, resting in the sun, in a trance-like, almost solemn state, as though listening together to a magnificent symphony and, in fact, doing just that: "hearing the leaves of spring, the rustle of insect wings, the wind darting over the face of the pond", and savoring the scent of the wind itself, feeling beauty, being absorbed by beauty—not what we call beauty, not the pretty things, but what is beauty: the knowledge inherent in all things, in a stone, a leaf, a blade of grass, the profound experience of harmony and connection with something deeply good, and deeply loving, the felt wisdom of being alive in a world of scent, and taste, and sound, and touch, with nerve endings responding in delight to every breeze, every faint happening, every detail in the world's face of dazzling color, and rolling movement, and depth. Those moments—full of feeling, brimming with exquisite awareness, giddy with the life within—she shared with the goats. But, in her moments of sorrow, she was alone. And she had moments of wrenching, inconsolable sorrow, some triggered by invisible quakes, others triggered by events that even we could see and understand, such as the times when the smell of lambs born, torn from their mothers, and slaughtered on neighboring farms filled the air and stirred her old pain, a pain that didn't lessen with time, but seemed to grow new thorns every spring. Those were the times when she wandered off most often, becoming separated from her adopted herd, getting lost and, in her blindness, unable to find her way home. Because human presence terrified her, the only way we could guide her back home was to call out to the goats hoping that they would respond loud enough for Marcie to hear and follow the sound trail back to the herd. The goats, she trusted, but humans evoked nothing but horror—the horror she remembered, and the horror she anticipated at our hands. We understood her apprehension, and went out of our way to not intrude in her safe zone. What we didn't understand then, and still don't fully understand today, is why she chose to narrow the physical and emotional distance between us, and got one inch closer to us every day until there was no distance left at all, until our noses touched, literally. She got nothing extra from our proximity. Nothing that she didn't already get in abundance while avoiding us—food, shelter, friends, treats were all readily available to her whether or not she accepted us. 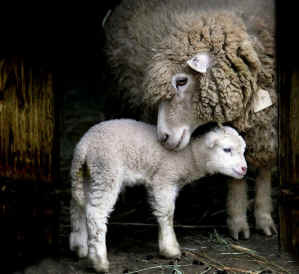 So why did she decide to trust us when, throughout her life, humans had done unspeakably cruel things to her for a taste of her babies' flesh, for a handful of wool, for a patch of lamb skin? Why did she suffer us, when she could just as easily ignore us? It's hard to say. But the fact is, she not only accepted us, she sought us out. If, in her estimation, we had been inside the house too long, she knocked on the door with her hoof and summoned us out. We came out every time, treat in hand—because that's what we assumed she wanted. And, for the rest of her life, she "drilled" us out on the porch this way several times a day. Then, her last year with us, she extended her vigils into the night. She started to wait up for Chris, stationing herself on the porch, waiting quietly, patiently, as long as it took—until midnight, until the following morning, until Chris was safely home from work. She waited without complaining, without asking for treats, or attention, or companionship, or any of the pleasures that we thought motivated her to knock on the door day after day. She just anchored herself at the front door, and kept her late night, solitary, vigils away from the security of the herd, away from shelter, under the open sky. And nothing could get her to move—neither Bluto's boisterous barking, nor the alarming distance from her goats, nor the rain, nor the thunder, nor the snow. She stood there like a good mother, wedged between earth and sky, with a mixture of courage, trust, expectation, hope, and resignation, her massive body firmly anchored between the big, bad, perilous world and her self appointed charge, and she didn't budge until Chris was safely home. Only then would she finally get up, leave the porch, and amble to her barn for the night, with the treat of solid proof that both of us were alive and well. It wasn't a "plan". It was a far simpler, far wiser, far more deeply felt truth than that. Marcie wished us life. She wanted for those she loved to continue to live, and she was determined that, for once in her life, they would. She demanded treat-in-hand proof of our wellness several times every day, and she guarded the porch at night until she was sure that both of her humans were alive and well. It was simple enough. Most of us can understand love. What most of us may never understand is how Marcie could forgive her abusers so completely that she was able to love their kin.